Billy hams it up a bit in the music video for "All For Leyna." © 1980 Sony BMG Music Entertainment. It was release as a single in the UK, but not in the US. 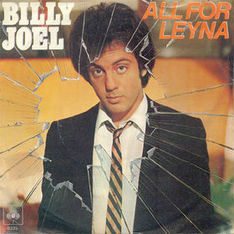 "All For Leyna" is another femme fatale song by Billy (see "Stiletto"). It describes a young man's infatuation with a woman, Leyna, and is more about the effect she has on the young man, rather than about the woman herself. Even though she leads him to peril, he is still desperate for her. If you have ever been crazy in love or lust with someone, then you'll understand. Apparently, the song was inspired by a young woman who was a friend of someone connected with Billy's band or management, and had visited the recording studio or office one day stirring up lust among everyone in the band, as well as inspiring this song. It is an urgent and raw synthesizer-driven song, pure 1980s pop. It is very much a teen angst song, the type of gnawing and painful angst a young teen feels when his love life is falling apart, and it seems like nothing else matters. Of course, it passes. Nelly Furtado, who became a Billy Joel fan when listening to Glass Houses as as young child, performed "All For Leyna" at a MusicCares benefit honoring Billy Joel in 2002. She won the Grammy that year for Best Female Pop Vocal Performance for "I'm Like A Bird." Van Gogh's "Self Portrait with Bandaged Ear" (1889). See the YouTube playlist for these songs. Billy gives a sneak preview of "All For Leyna" in a 1979 concert in Houston before the release of Glass Houses in 1980. Billy sings "All For Leyna" at the Bonnaroo Music Festival in 2015. He says it was a "song I should have written when I was about 16."